We’ve had a tremendous amount of rain over the Kerr Lake watershed this week. In less than 72 hours the lake level has climbed nearly 11 feet. And we’re talking about a lake with 850 miles of shoreline, so that’s a lot of water. Tiny feeder creeks that are normally only three feet wide have transformed into fully flowing rivers big enough to drive a boat in. Huge willow bushes and logjams that were on dry land last week have completely disappeared beneath the water. Navigating the lake in these conditions is hazardous at best. The Dan and Staunton rivers that feed into Kerr Lake are flooded out of the banks. Their rushing waters pick up debris (from twigs to entire trees) and wash it into the lake. The water clarity is that of chocolate milk, and to top it off the rain has caused the water temps to plummet from 70+ degrees to the low 50’s. Most boat ramps have been closed by the Army Corp of Engineers due to flooding, but who would want to fish in those conditions anyways? Well, there is one group of anglers. 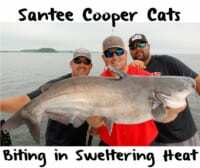 Savvy cat fishermen know that these are ideal conditions for big blue catfish. Native to the Mississippi River, these fish are evolved to thrive in heavy current and muddy water. Fortunately, I found a couple of days in between guide trips to get on the water with my wife and fish these imperfectly perfect conditions. On the way to the lake Wednesday we stopped at Bobcats, the local tackle shop, to fuel up and get a quick fishing report. There we learned that a 101-pound blue cat had already been weighed in earlier that morning before being released. When I heard that news I had a feeling it was going to be a good trip, and I was not let down. While we didn’t catch any 100-pound fish, we did end up with 54 catfish in two days, ranging in size from eight to 32 pounds. Most of our fish came from following a pretty simple concept; find the bait, find the fish. It’s an old adage, but it couldn’t be truer when it comes to locating blue catfish. April and May are prime feeding times. Many of the larger fish are about to make a long run up the river to spawn in June, so they are fueling up for their journey. Gizzard shad are high on the menu this time of year due to their abundance. And while high water conditions are favorable for catfish, they are not so good for shad. Heavy current makes it difficult for the shad to swim. The sudden temperature change also shocks them and makes them even more susceptible to becoming dinner. 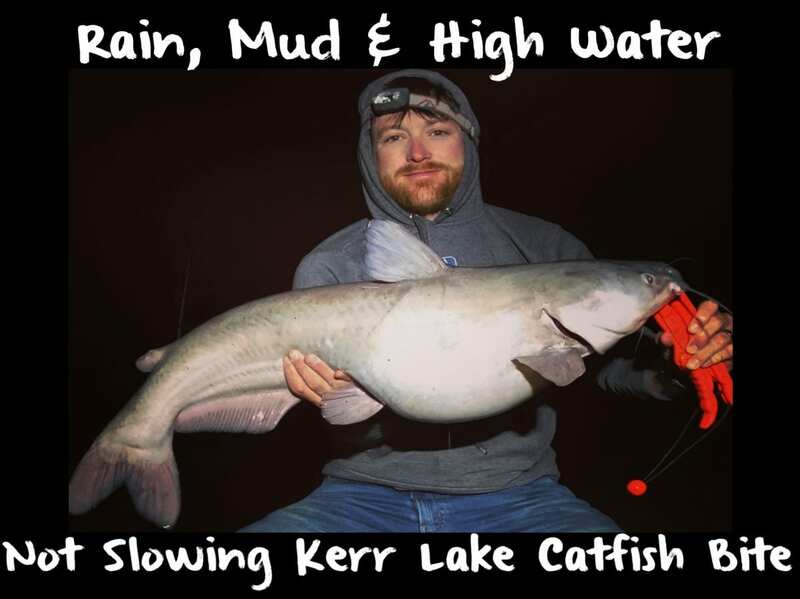 Finally, the muddy water limits visibility, which puts the catfish at a great advantage. But shad don’t just sit back and get eaten. They seek out more favorable conditions in the way of small feeder creeks. These creeks tend to have much less current than the main river. Because of this they also tend to be a little less muddy and warm up a little faster. When the water rises the shad will push back in these creeks as far as they can, and the catfish will follow. In addition to just fishing the backs of the feeder creeks, you can fine-tune your approach by looking for places where there is a break in the current. This could be behind a willow bush, a stump, a rock, a hump, or even a deep hole. 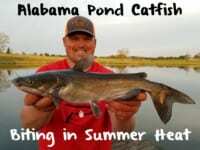 Catfish and shad alike will seek relief from the current in these areas. As for bait, there are a few things I consider when fishing these conditions. Because visibility is diminished in muddy water, I believe a catfish primarily uses its sense of smell to locate bait. This is where Catfish Nectar really shines. My top 3 baits this time of year are shad, crappie and white perch. I soak my baits overnight for the best results. When fishing current, I reapply Catfish Nectar frequently. As a general rule, if I haven’t gotten bit in 30 minutes I will reel in and reapply. I can’t tell you how many times I’ve done this and cast right back to the same spot to catch a fish within two minutes. Remember, smell is everything in these conditions! To wrap up, the next time you get a big rainstorm you don’t hesitate to get out there and fish! I hope these tips will help you catch more fish. Thanks for reading! Editor’s Note: Wes “Redbeard” Jordan operates Redbeard Cats Guide Service on Kerr Lake. 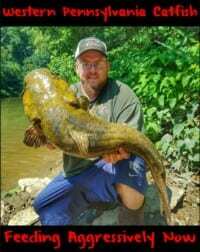 For more info on his guided catfish trips please visit www.redbeardcats.com or https://www.facebook.com/pg/RedbeardCats. 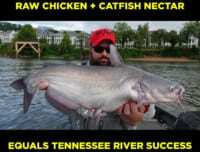 Catfish Nectar is available at Walmart & Bass Pro.